Advertising opportunities are available for both the Hong Kong and the global FastFacts travel guide network. WL Media has a network of travel guide sites under the branding "FastFacts" that give a short and quick introduction to points of interest around the world. As WL Media is located in Hong Kong the network includes aa large number of guides that are dedicated to places of interest in Hong Kong, but the network also branch out into places we have been, or those we would just like to go. Advertising opportunities including banner ads, native content and sponsorships are available cross the network. With highly targeted readerships that have a strong interest in tourism in the destination countries the guides are a great place to put a promotional message. 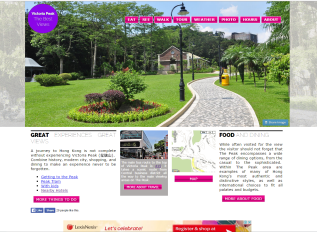 Going back over 10 years to the original hkfastfacts.com site launched in 2003 which covered, and still covers Hong Kong as a destination, the network has since grown to include major attractions around Hong Kong such as Stanley Market, Ladies Market and Victoria Peak. Today the network has been expanded to cover destinations from the obscure to the famous, but always sticking to our concept of covering areas which had poor information previously so that the WL Media guides could truly be bringing something useful to the web and to travellers researching their destinations. Because of the fact based structure of the guides the readership is very much weighted towards those doing active research on the destinations. Whether the reader might be looking for the opening hours of an attraction Rome, the best way to get from Causeway Bay to Stanley Market in HK, or wondering when Chinese New Year will fall next year and how that will effect their plans, they are certain to come across the WL Media FastFact guides. Therefore the readers are mostly people in the late stages of the buying cycle, who have selected or nearly selected their intended destination and planning the final stages of their itineraries, and so need information on opening hours, ticket prices, best routes and similar factual information. A substantial group of readers of the website, varying depending upon the destination, are visitors who have already travelled to the city in question, and are now making their way to the particular attraction. These readers are good candidates for targeting by owners of other attractions within the city. Although it varies depending on the destination on average approximately a third of readers are located within the city or country of the attraction when they visit the WL Media travel guide to that attraction. The exception to this would be the USA sites where the majority of the readership is local to that country, if not the state, due to the large amount of internal tourism that happens in America. The sites in the network cover a huge range of attractions in a range of areas of interest. The guides to the most popular attractions in some cites, to the most obscure yet fascinating ones in other countries the guides follow no guideline except for being factual and informative. The most complete and comprehensive part of the work is the HK FastFacts Travel Guides Network and advertising opportunities i this part of the network are available for immediate booking. Consult the advertising rate card for rates, demographics, technical specifications and terms and conditions. Advertising opportunities on that HK network and on the remainder of the WL Media network, including global and smaller HK properties, are also available subject to discussion. If you have a specific advertising need, such as reaching beach lovers in California, or foodies in Austria, or shoppers in Doha then contact us to discuss your needs as we can satisfy all these any many more. The websites range in size from medium to small to mini depending upon the size of the topic and the amount of interest. Each destination which has been selected for a WL Media FastFacts guide is one for which there is a gap in the publicly available information. Attractions: from small to large, from obscure to world famous, from traditional to modern. Sneakers Street is very much a niche tourist attraction, but one that is actively being promoted by the Hong Kong Tourism Board with signage on the streets and listings in brochures, mobile phone apps and the Discover Hong Kong website. Recognising the growing importance of this destination, which is particularly popular with visitors from the Philippines, Singapore, Malaysia and other SE Asian countries WL Media developed a FastFacts guide dedicated to just the key facts that readers need to know when planning there visit. 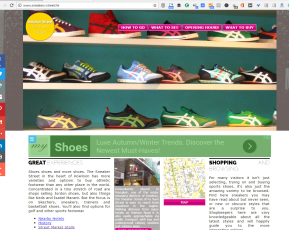 Within months of launch the website had good rankings and placements in all search engines for topics relating to Sneaker Street and was satisfying demands for information on location, opening hours, prices, brands and deals. This has been recognised by links back to the site from respected names in the hotel, travel, newspaper and blogging worlds such as Tripadvisor, Australian Herald Sun newspaper, Expat Woman magazine, Stay.com and the L'Hotel group. sneakers-street.hk are available. Read the advertising rate card for details or contact us for specific requests such as content promotion. Victoria Peak is arguably the most important single attraction in Hong Kong. No tourist can miss the experience of viewing the harbour from the peak, every article or travel guide to HK mentions it prominently and tours always feature it. Yet despite its fame and importance the material available to the reader, tourist or researcher was curiously one-sided until WL Media developed the hk-victoria-peak.com website which for the first time gave an entire overview of the attraction, not just the tram or the observation tower. Now over 10 years old the site has been through multiple iterations brining more details, better styling and greater relevance with each new design. Today it provides a clean modern guide experience focusing on key facts such as public transport, dining and walking routes. An extensive gallery allows the visitor to see the different aspects of the destination, from nature trails to modern shopping malls, and plan out their activities. The uniquely encompassing approach to straight unbiased information has allowed the site to gain recognition from organisations as diverse as Hilton Hotel Suggests Guides and Hong Kong Tatler Magazine with many in between. contact us directly to discuss your promotional needs. hkfastfacts.com - The original guide to the whole of HK. hk-stanley-market.com - The one stop destination for all tourist visiting this shopping destination. ladies-market.hk - Where all things for all ladies are available at bargain prices, this website explains all. hk-victoria-peak.com - Unbiased guide to the top ranked HK destination. temple-street-night-market.hk - A traditional attraction now gaining international recognition and is covered by this website. sneakers-street.hk - Website about this shopping street turned into an attraction that gets interest from SE Asian visitors. nathan-road.hk - The ultimate strip for tourists in HK is covered by this guide. tsimshatsui.hk - Hong Kong's main tourist district, explained and discussed in our website. cunningcanary.com - Our comprehensive blog and guide to Gran Canaria, this key island of the Canary Islands. nashmarket-vienna.com - The one stop reference to the biggest outdoor food and dining marketing in Austria. The expertise in identifying information gaps, and filling them with just the right amount of information, has given WL Media great insight into the SEO potential for all types of business but particularly those in the travel and entertainment industries. If your are tasked with promoting a travel destination, from a hotel to a restaurant, from a bar to a resort, then WL Media HK can leverage the more than 10 years of experience to get you onto the fast track to success. By blending authoritative content with technical SEO, appropriate and ethical publicity as well as social media outreach we can get you brand to stand out on the internet. Consulting services are charged at HKD1,200/hour for ad-hoc requests, but quoted and project rates apply to other tasks. Contact us for a free chat over a coffee, and a quote for your project. Two experienced consultants are available to work on your travel industry website, who combined have have over 30 years of online development marketing experienced. Having worked in various technical and marketing roles for companies ranging from Fortune 500 multi-nationals through to sole-practitioners they understand scale and efficiency in a very practical manner. Able to call on examples and real-world examples their skills extended from client engagement, through project management down to the arcane details of Google webmaster guidelines and the latest HTML standards. Winnie not only loves to travel, and who doesn't, but has the solid technical skills to turn her interest of destinations both near and far into solid functional and attractive websites. Whether you find her working with the latest Wordpress builder themes, or hand crafting HTML she uses her formal IT Systems Analysis and Design skills in combination with a feel for the online experience to build out digital experinces that just work. Whether being an armchair explorer via Google Earth or walking the obscure lanes of Hong Kong island's Western District Raymond can switch between being a local and thinking like a visitor. He combines 30 years of experience of working with IT to make it servce business functions in companies as big and as small as they come. Today he keeps up with trends in Google, Facebook and mobile to ensure that works for him works for your audience and your business as well. By developing travel websites about Hong Kong and popular destinations around the world the WL Media team is able to provide useful information for travellers and a platform for advertising targeting travellers to those destinations. 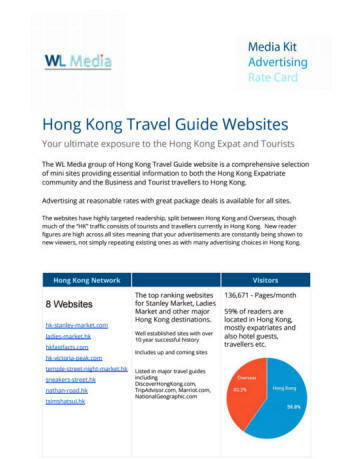 For full details of advertising opportunities on the WL Media travel guide network, download our Rate Card. As well as traffic and demographic information on each site the T&C, ad formats and prices are included. Don't miss out on the rate discounts of up to 25% available for certain options. In addition, more sites are always under development and being added to the list so, come back often to check or subscribe to our travel network mailing list to learn when we have new sites and special offers.